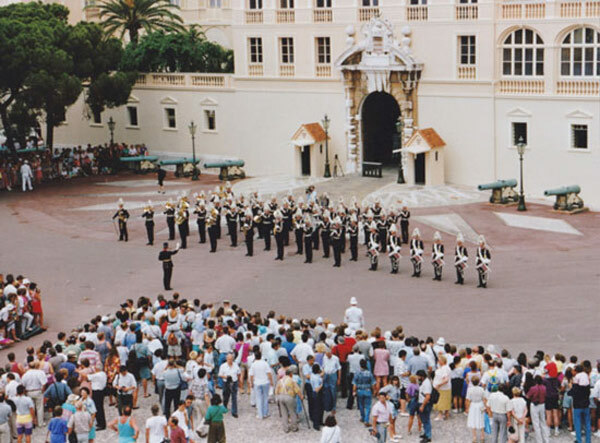 Europe’s “Final Countdown”, performed by the Swedish Army’s Musical Platoon (AMP) on the Palace Square in Monaco, 1992, at a time when relations between Sweden and Monaco were grand, thanks not least to Sweden’s Consul in Monaco at the time, who arranged this event with the help of a Swedish Army Captain * and Mr David Fristedt. A year later, Monaco joined the United Nations. Late Prince Rainier III’s last wish for Monaco was that to see it joining the European Council, a wish that were to be granted. Monaco’s obligations towards said Council are now to be fulfilled in His memory. This suggests the dismantling of the “Direction of Judicial Services”. Photo realized by David Fristedt. 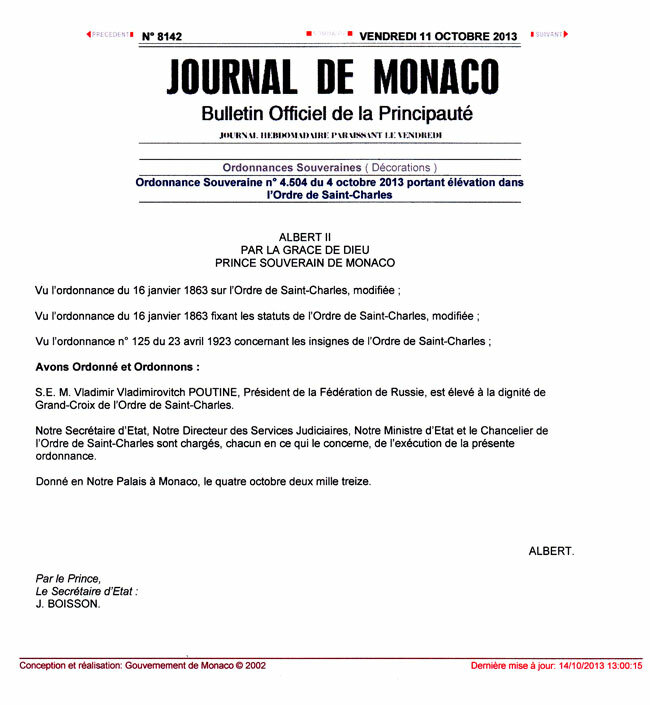 “ Our ref : Club 137 : Criminal complaint in a haste as of the 28th of January 2013 within article 137 of the Monegasque Criminal code against Mrs Honorary Consul General of the Kingdom of Norway and Bailiff in Monaco Claire NOTARI, free / at large. On the 17th of March 2014, the commissioner for the European Council on the eventual adhesion of Monaco to said council, Leonid SLUTSKY, was finally sanctioned , through means of not least the freezing of assets by no less than the President of the United States of America Barack OBAMA http://www.whitehouse.gov/the-press-office/2014/03/17/fact-sheet-ukraine-related-sanctions. For Europe’s security as of spring 2014, those in power in Monaco ought however sine qua non to be added on that list. Indeed, the measures taken since (financial gap in time) by the United States of America and the European Union would otherwise hardly be enforceable in practice. This goes for insurance companies toohttp://www.ascoma.com/en/the-group/organisation.html. A hint was given to H.M. the King of Sweden in the letter that Patricia HUSSON falsified, in France (French jurisdiction). More on this under topics 3, 5, 8, 9 and 11. “Hold the border!” Swedish Prime Minister Thorbjörn FÄLLDIN, 1981. With Sweden’s consul in Monaco Patricia HUSSON as the simultaneous advisor to dictator Prince Albert II of Monaco, this quote now goes for NATO’s attention, since France allows Monaco to breach their bilateral treaties. 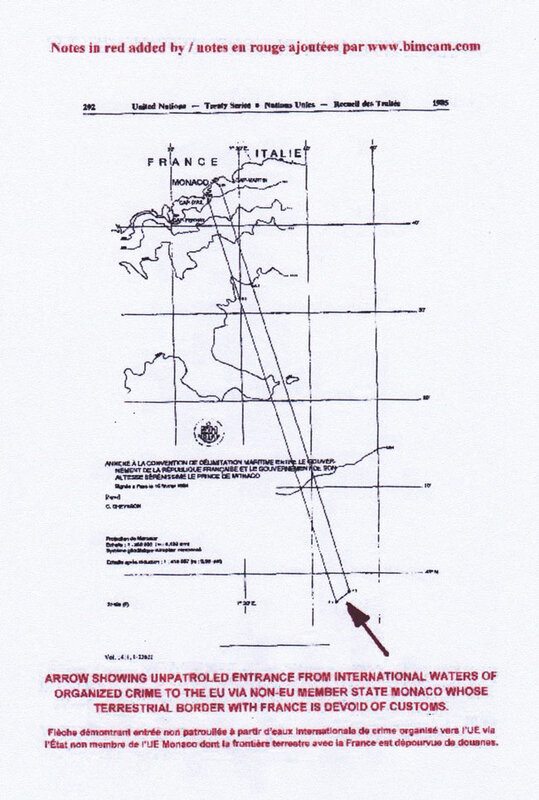 Do note that since the treaty is from early 1984, and was not registered until late 1985, BIMCAM has not had the time to verify whether the geographic information on the then non UN-member had been updated in time regarding WGS 1984. Reliable updated maritime charts are usually those from the Admirality, with the mention “DEPTH IN METERS”. Link to UN-convention with original map. HUSSON and Albert II are members of the “Comité Directeur“, YCM (Yacht Club de Monaco). 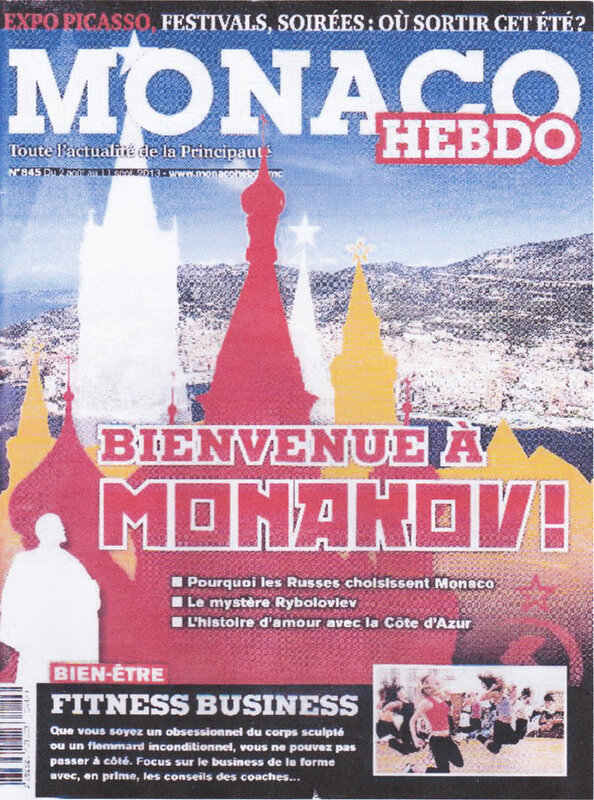 On the 7th of January 2014, Minister of State Michel ROGER declared the whole year 2015 to be dedicated to the celebration by Monaco of Russia, since a deal struck between Prince Albert II and Vladimir PUTIN http://www.monacohebdo.mc/13374-2015-annee-de-la-russie-a-monaco. There is no record in World history of any state committed to celebrate another one for 365 days in a row. On the 4th of October 2013, Prince Albert of Monaco gave the Russian president the finest Monegasque distinction, the Grand-Cross of the Order of Saint-Charles. Philippe NARMINO and the non elected Minister of State Michel ROGER (appointed by Albert and NARMINO), a French citizen and former judge in the Supreme Court, were executives of such measure. *This medal can only be awarded for great services rendered to the country or the person of the Prince. Lately, Russian bomb planes were headed towards Sweden. Danish F16 fighter jets (not Swedish JAS-Gripen) reacted immediately and successfully from NATO’s base in – according to Expressen – Lithuaniahttp://www.expressen.se/nyheter/ryska-plan-ovade-attack-mot-sverige/. Sweden has an obligation of military protection of the Baltic States. This means in practice that NATO can use Sweden as a base should Russia try to invade Latvia, for instance http://www.aftonbladet.se/nyheter/article18734684.ab. See moreover the Monday Movement which twentieth’s anniversary was commemorated by Fredrik REINFELDT and the Baltic Chiefs of State on the 15th of August 2011. On topic 8, BIMCAM wrote: “Additional information of 19 September 2011 due to new events of August 2011” in what was to become the by now since long time ago already resolved HUSSON-MALBRANCKE AFFAIR. Any international initiative by Monaco’s dictator Prince Albert II (not elected, with a non elected “prime minister”) must go through the Crown Council, chosen by the prince himself. This is written in the Monegasque Constitution. Sweden’s consul in Monaco Patricia HUSSON has thus as Monegasque Crown councilor given the go-ahead for the Russian year in Monaco, the medal to Russia’s president and so forth. She has proven that she acts in the name of Sweden at whim, when it suits her. If Prime Minister REINFELDT does not put an end to her being a consul for Sweden, then this will be of concern to NATO. Prince Albert has allowed her to forge correspondence with Sweden’s Chief of State, in the name of Sweden. She acts against both Swedish interests as well as those of NATO’s. Smooth operation / Russian coup d’État? NARMINO-controlled Monaco Hebdo’s 2013 summer issue #845. How many warnings does the World need? Monaco’s membership within the European Council since soon ten years ought to be urgently reconsidered, or – in light of Slutsky’s and Russia’s involvement in the matter, to be declared null and void: better safe than sorry. Since that date, Albert II’s presumption of innocence has always prevailed during the editing of the present inescapable web-based Swedish publication, by default of a Monegasque free press, published in French and in English in accordance with the policy of the European Court of Human Rights in Strasbourg. However, reality wins over fiction, as shows Sweden’s headache and historically fatal blow to Monaco below, thanks to Patricia HUSSON. Red masking by BIMCAM. This is a by Swedish authorities confirmed secret conviction bearing the stamp of the Consul of Norway, bailiff Claire NOTARI (topics 1, 2, 8 and more), member of the Club 137 (see top of page). It has brought about criminal complaints within Europe, and not least on the 7th of April 2014 against First Court registrar in Monaco Béatrice BARDY and – with the Swedish Government’s Office as BIMCAM’s witness, the secretary of Philippe NARMINO – Martine PROVENCE. For now, BIMCAM just cannot publish the information to its Swedish Government, due to Patricia HUSSON’s double loyalties. Nevertheless, BIMCAM herewith declares Prince ALBERT II as the head of the Club 137. To read the entire letter (Encl. nr 4 of the Supreme Court and thus of former prosecutor general Jacques RAYBAUD), click here. Ever so biased Albert II of Monaco acts as judge in a court of first instance, in the name of God. Note to the European Council. The self-incriminated members of Club 137 are all united on or in this historical, disgraceful document. Didier ESCAUT with his wife the bailiff Marie-Thérèse ESCAUT-MARQUET and Sweden’s consul in Monaco Patricia HUSSON. The words “Court of appeal” refer to Brigitte Grinda-GAMBARINI. To the left is the supposed signature of the current client of lawyer Didier ESCAUT, prosecutor general Jean-Pierre DRENO, who stood trial on last 7th of April 2014. In the upper left corner is the stamp of the Consul of Norway, whose Monegasque bailiff address is that of the Norwegian Consulate. Look at the red stamp, and note the address of 17, Boulevard Albert 1er, and compare with this Norwegian link. This is the predicted result of the actions of Sweden’s Consul in Monaco, Patricia HUSSON. Under the criminal complaint against the consul of Norway in Monaco Claire NOTARI (see extract on top of this page) and considering the alarming information therein for the interests of the Kingdom of Norway, BIMCAM wrote to DRENO that a letter to the Norwegian Minister of State was due before the 17th of May 2013 (Norway’s national day). Said Minister lost the elections, but is now head of NATO. Nevertheless, a letter to the current Norwegian Government seems to be in order, should it not fire Claire NOTARI before the upcoming 17th of May. One may think that a certain Eva JOLY would agree. Here are Transparency International’s statistics of which Monaco is formidably absent: http://cpi.transparency.org/cpi2013/results. Monaco fails so badly as to not even figure within them, since it is too closed a country for credible journalists to enter this to the European Council wrongfully admitted member and make due investigations. Best in class, anno 2013: Denmark and New Zealand (1), Finland and Sweden (3); Worst of the class: Somalia, North Korea and Afghanistan (175), Sudan and South Sudan (174) and Libya (172). After having been briefed, the Swedish Minister of Foreign Affairs Utrikesminister Carl BILDT used the expression Quisling to describe one of the individuals mentioned above in the link from the American White House. Well, with these two consuls in Monaco for two Nordic countries, the Quisling Virus seems to have become epidemic. ENOUGH IS ENOUGH, MISTER SPIELMANN! In an official letter prior to the above shown proof of Albert II acting as a judge, the current president of the European Court of Human Rights Mr Dean SPIELMANN was duly warned about the false information he had gotten from Monaco and was given access to the uncensored, alarming police reports on Philippe NARMINO. Instead of reflecting upon the worrying signals the letter obviously sent, Mr SPIELMANN did the opposite and more or less wrote a “love letter”, stressing the particularly remarkable skills of Monaco’s judge at the ECHR (a former judge of Monaco’s court of first instance), and speaking for all magistrates and lawyers of Monaco. 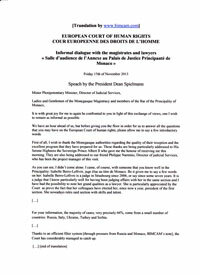 Mr Spielmann’s “as informal as possible” [sic] speech to the honour of not least Philippe NARMINO in Monaco, on the 15 November 2013 was written on an awkward head letter of the European Court of Human Rights containing also the logo of the European Council. Said Court cannot find any an English translation of it. BIMCAM has obviously remedied to it, but waits for the Court in question to provide an official translation. The content of the letter suggests Dean SPIELMANN’s imminent resignation in what is now known as the MONACO-SPIELMANN Affair http://www.echr.coe.int/Documents/Speech_20131115_Monaco_FRA.pdf. The whole idea of the ECHR is to protect the individual from abuse by State authorities. It is through Russian and Monegasque pressure that the ECHR now has a single judge appointed to judge for himself or herself if a case is deemed transferable to the actual Court, who befriends the head of States put into question, hence stripping it of its initial reason to be. This happened concurrently with the appeal after the judgment commented under topic 1. One of the judges therein, now Minister of State Michel ROGER, brags in writing about how the ECHR ought to have legalized all his actions. The corruption is pouring over like the Champagne which some bring in in too big a haste, shaking the bottle in the process. Indeed, if there is something that Monaco is World champion at, it is to make their guests of choice feel very, very special. This has just been proven once again. Leonid SUTSKY was of way greater concern to what was to become BIMCAM than Philippe NARMINO ever was. A huge dossier to the European Council now comes into light. Here is an example of a letter sent four days after that sent to Philippe NARMINO on the 5th of March 2007, and addressed to the Committee on the honoring obligations and commitments by Member States of the Council of Europe (red masking by BIMCAM). Minister of State Michel ROGER has been given a few hints since. Needless to say, he has failed miserably in terms of acting upon them. To read the letter, click here. Recently, Leonid SLUTSKY offered a whole mammoth to Albert II. It is to be viewed at the “Musée d’anthropologie de Monaco”. “During the mammoth’s era (Au temps des mammouths)”. It should be displayed alongside Monaco’s Code of procedure, one which Philippe NARMINO admits to need changing by a fifth in order for Monaco to comply with its obligations towards the Council of Europe (see quote # 1289). Under topic 10, in DF’s first ever complaint of 133 pages addressed to current (?) general prosecutor of Monaco Jean-Pierre DRENO or DRÉNO, client of Didier ESCAUT, defense-lawyer of the swindler whose judgement of convition was stolen with criminal intent by Patricia HUSSON, DF went into great detail in two languages to harvest proofs. In some of the attached documents, a former president of the European Council and member of Monaco’s Ambassadors’ Club Mr René van der LINDEN was mentioned (see Russian controversy). To read an excerpt of a letter addressed to him as of April 2006, click here. The final countdown for Monaco begun on the 13th of May 2004 with the receipt of warnings to the Monegasque Police, with retroactive effect as from the 17th of May 2004, the national day of the Kingdom of Norway, now forever to be linked with Claire Notari. Michail Chodorkovskij angående en viss typ av Statsapparat. ”Antingen spelar man med, får en bit av kakan och känner sig som en skit, eller så bekämpar man problemet och tar skiten. Det är systemets spelregler. Det finns en tredje lösning. Den valde Jurij Ivanovitj – han lämnade in sin avskedsansökan. Fast är det verkligen en lösning? Det leder ju till ett negativt urval. Så småningom är det bara de sämsta kvar i systemet. Somliga saknar intelligens för att förstå, andra moral för att åtminstone inte medverka när det har förstått. 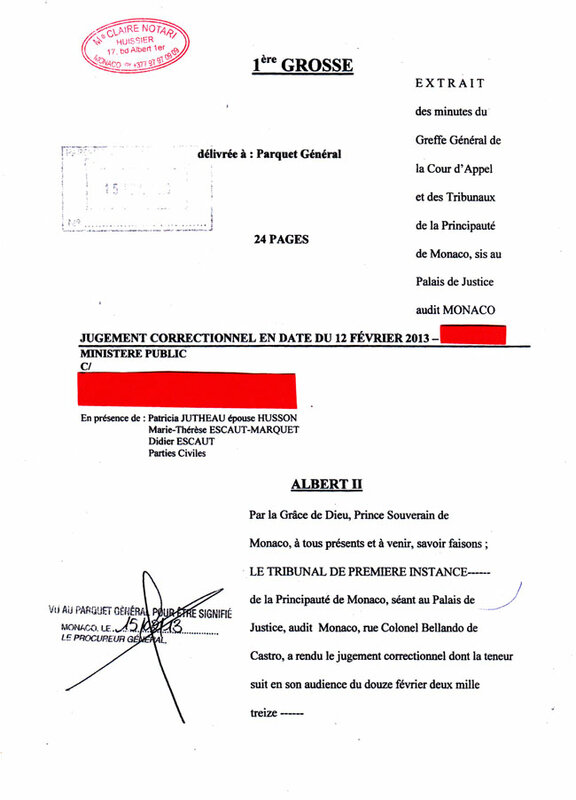 Here below is the official criminal complaint against Claire NOTARI, received the day before the illegal so called trial (see above) by Jean-Pierre DRÉNO, Monaco’s soon to be ex-prosecutor in Monaco. It has recently been sent to the prime minister of the Kingdom of Norway, Statsminister Erna SOLBERG, successor to Jens STOLTENBERG, now head of NATO.  to life imprisonment when the aggravated crime renders to any other guilty a person the sentence of ten to twenty years or life imprisonment. The following complaint is the tip of the iceberg. For instance, the Swedish Government has been able to see Notari’s habit of putting her official stamp on the Monegasque authorities’ forgeries, not least regarding the famous letter to H.M the King of Sweden subjected to at least three different forgeries in the ever so ongoing blackmail. BIMCAM moreover has quite a devastating report related to art sales and money laundering. Before its publication, and in the spirit of damage control, the closure of the Norwegian and Swedish consulates in Monaco is being called for. The Government rejects the demand. The general prosecution’s office within the Principality of Monaco has asked for Swedish assistance in an ongoing, Monegasque penal procedure. Said Monegasque authority’s request translates into a demand of hearing by Swedish authorities of Monica Fristedt and David Fristedt. According to the request, said persons are being suspected of penal infraction(s) in terms of damaging the honour of x on a website. The Ministry of Justice sent the affair to the Prosecution’s office, which in turn sent it to the Chancellor of Justice. The Chancellor of Justice decided on the 5th of December 2014 to not act upon the request and to forward all elements of the affair to the Government, should it not approve of the Chancellor of Justice’s judgement, i.e. for the Government to see for itself wether any a legal assistance could be provided. The request is pursuant to actions that are protected by the fundamental Law on the freedom of expression. The Chancelor of Justice has judged that as far as any a hearing with Monica Fristedt be concerned, there are no possibilities for any a favourable action upon such request due to the fundamental Law on the freedom of expression. The Government agrees with this judgement. In earlier decisions, the Government has stated its position, namely that in cases where the Chancellor of Justice rejects a request due to Swedish Law, the Government shall follow through with such decisions in accordance with the fundamental Law on the freedom of expression. The Government finds no reason to reach any other conclusion. The request is hence to be rejected in this matter. Moreover, the Chancellor of Justice has judged that any a positive outcome for the request, in terms of legal a hearing with David Fristedt, could eventually come into conflict with Swedish general principles of Law in the domains of freedom of press and of expression. The 2nd chapter, §14th within its first paragraph states, in terms of international judicial assistance in penal matters, that should a compliancy with such request of legal assistance be in conflict with Swedish general principles of Law, it must be rejected. The Government finds that any a compliancy with the present demand breaches the Swedish general principles of Law in the domains of freedom of press and of expression. The request must henceforth even for this reason be rejected. Article 2 in 1959’s European Convention on mutual legal assistance in penal matters provides for the receiver of such request to reject it should the requesting State’s general principles of Law be in conflict with those of the requested State.